Be sure you have all your travel documents with you: valid passport, Electronic Travel Authorization (eTA), visa, etc…. More information on the Government of Canada Visas and Immigration page. Fill in your customs declaration card completely. To learn more, visit the Canada Border Services Agency website. When you are talking with the Canada Border Services Agency officer, remove your hat and sunglasses. Bringing plant and animal products into Canada is forbidden. 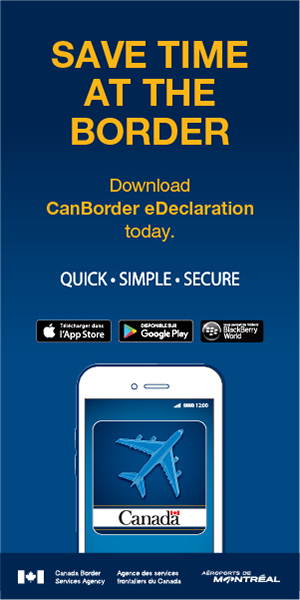 For information about restrictions on importing alcohol and tobacco products as well as on the amount of money you can bring with you, visit the Canada Border Services Agency website. Representatives of Accueil + are on hand in the terminal’s public area to welcome you and provide you with documentation.